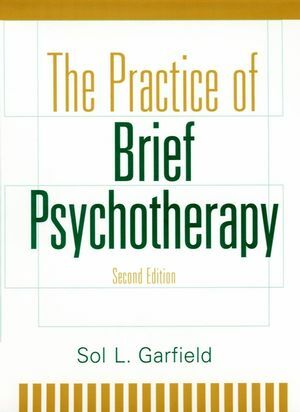 Since its publication almost a decade ago, Sol L. Garfield's The Practice of Brief Psychotherapy has become the definitive training text and professional guidebook on brief psychotherapy with an eclectic point of view. But even as managed care has made the practice of brief psychotherapy a mainstay for many therapists, it has become increasingly difficult for clinicians and trainees to keep pace with fresh developments in the field. This revised edition brings Dr. Garfield's classic straight to the cutting edge of current practice, providing a comprehensive, integrated picture of brief therapy based upon up-to-date procedures and research findings. Written by one of the "founding fathers" of brief psychotherapy, The Practice of Brief Psychotherapy, Second Edition includes appraisals of the latest research on evaluation techniques, treatment guidelines, effectiveness, and "validated therapies." It walks today's clinician step-by-step through the basic aspects of the therapeutic process, moving through every stage from initial interview through termination and posttherapy appraisal. As in the successful first edition, this book is results-oriented, focusing on procedures and findings from diverse therapeutic approaches for their usefulness in achieving positive outcomes. Shedding light on crucial therapeutic variables in psychotherapy, it explores common and specific factors of therapeutic value that transcend individual methodologies and techniques. Timely and more relevant than ever, this Second Edition of The Practice of Brief Psychotherapy gives clinicians, counselors, and students an excellent and broad-based practical reference on brief psychotherapy-a powerful and flexible clinical tool for their work. Over the course of his long and distinguished career, Sol L. Garfield has received numerous prestigious awards, including the American Psychological Association's. Distinguished Contribution to Knowledge Award, the Distinguished Contribution to Clinical Psychology Award from the APA's Division of Clinical Psychology, the Society for Psychotherapy Research Distinguished Research Career Award, and the Council of University Directors of Clinical Psychology 3rd Annual Award for Outstanding Contributions to Clinical Training. He is the author or editor of many books, notably the Handbook of Psychotherapy and Behavior Change (coedited with A. E. Bergin), now in its fourth edition, and Psychotherapy: An Eclectic-Integrative Approach (both published by Wiley). Dr. Garfield has also contributed over 150 journal articles or chapters to edited volumes. "A well-written and useful approach to brief therapy." -Clinical Psychology Review. "Provides a lucid and approachable discussion of each of the ingredients that go into the [brief] psychotherapy mixture." -Contemporary Psychology. This revised edition of Sol L. Garfield's The Practice of Brief Psychotherapy brings his classic work fully up to date with the latest developments in the field-from recent research findings and trends in managed care to new viewpoints and approaches to psychotherapy. Like its predecessor, this edition offers an eclectic approach to brief psychotherapy based upon what works-favoring procedures that appear most appropriate for a given case, and whose effectiveness is backed by empirical research support. The result is an accessible and comprehensive resource that is of outstanding practical value to practitioners and students of brief psychotherapy and counseling. SOL L. GARFIELD, PhD, is Professor Emeritus of Psychology at Washington University. Since receiving his doctorate in clinical psychology from Northwestern University in 1942, Dr. Garfield has held teaching positions in several psychology departments, including those of Northwestern University, the University of Connecticut, Ohio State University, and Columbia University. A certified practitioner since 1947 and a Diplomate in clinical psychology since 1952, he has served as a clinical psychologist with the U.S. Army and as chief clinical psychologist at several VA hospitals. He has also held prominent positions in many professional societies, including President of the American Psychological Association's Division of Clinical Psychology; President of the Society of Psychotherapy Research; and member of the American Psychological Association's Task Force on Psychological Intervention Guidelines. From 1979 to 1984, Dr. Garfield served as the editor of the Journal of Consulting and Clinical Psychology. What Are the Therapeutic Variables in Psychotherapy? The Middle of Interim Phase of Therapy. Brief Psychotherapy: An Appraisal, Summary, and Concluding Comments.